[110 Pages Report] The shell & tube heat exchangers market (2015–2020) is estimated to reach USD 7.05 Billion, by 2020, at a CAGR of 4.98%. The report includes an analysis of the shell & tube heat exchangers market, by application, such as chemicals, petrochemicals and oil & gas, HVAC & refrigeration, food & beverages, power generation, pulp & paper, among others; and by region, namely, North America, Europe, Asia-Pacific, and RoW. The base year considered for the study is 2014, while the forecast period is between 2015 and 2020. The shell & tube heat exchangers market is driven by the increasing energy demand and stringent environmental regulations. Both, top-down and bottom-up approaches have been used to estimate and validate the size of the market and to estimate the size of various other dependent submarkets in the overall shell & tube heat exchangers market. The research study involved the use of extensive secondary sources, directories, and databases such as Hoovers, Bloomberg, Chemical Weekly, Factiva, Tubular Exchanger Manufacturers Association, Inc. (TEMA), American Society of Mechanical Engineers (ASME), Heat Exchange Institute (HEI), Securities And Exchange Commission (SEC), American National Standards Institute (ANSI), among other government and private websites, to identify and collect information useful for the technical, market-oriented, and commercial study of the shell & tube heat exchangers market. The shell & tube heat exchangers market (2015–2020) is estimated to reach USD 7.05 Billion, by 2020, at a CAGR of 4.98%. The shell & tube heat exchangers market is driven by increasing energy prices and stringent environmental regulations, which are driving the demand for shell & tube heat exchangers. However, the increasing cost of raw materials used for shell & tube heat exchangers manufacturing is expected to inhibit the growth to some extent. The shell & tube heat exchangers are the devices that facilitate the exchange of heat between two fluids, which are at different temperatures while keeping them from mixing with each other. The shell & tube heat exchangers are used in various applications such as chemicals, petrochemicals and Oil & Gas, power generation, HVAC & refrigeration, food & beverages, pulp & paper, among others. These are the main applications considered in the report. In 2015, the chemicals application is estimated to account for the largest market share among all the applications, in terms of value, followed by petrochemicals and oil & gas, HVAC & refrigeration, and power generation application. The chemicals application is estimated to register the highest CAGR between 2015 and 2020 among all the applications considered. Asia-Pacific, North America, Europe, and RoW are considered the main regions for shell & tube heat exchangers market in the report. 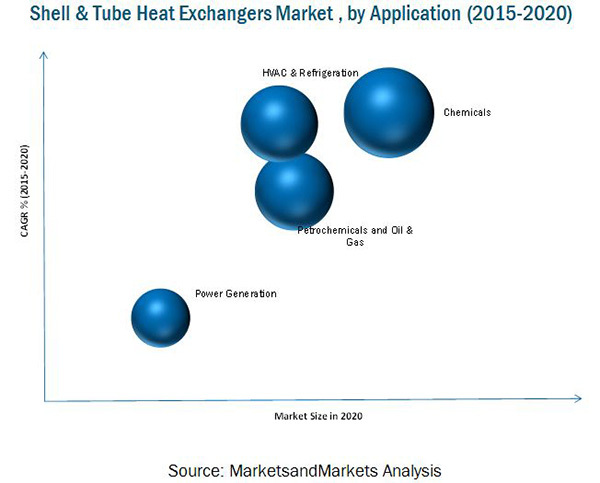 The European region is dominant in the shell & tube heat exchangers market. The rising demand for shell & tube heat exchangers in this region is mainly driven by its strong demand in the chemicals application. The North American region is the second largest consumer and manufacturer of shell & tube heat exchangers, globally. The market in this region is mainly driven by the growing opportunities from oil & gas industry and also from the fastest growing chemicals industry. The chemicals and petrochemicals and oil & gas applications are the top two applications contributing to the growing demand for shell & tube heat exchangers in North America. RoW is expected to be the fastest growing region between 2015 and 2020. Though the shell & tube heat exchangers market is growing at a significant growth rate, a few factors hinder the growth of the market, globally. The higher price of raw materials, shift of end-user market from developed countries to the developing countries, and the rising cost of production are the major restraints in the growth of the shell & tube heat exchangers market. However, SPX Corporation (U.S.), API Heat Transfer Inc. (U.S.), and Southern Heat Exchanger Corporation (U.S.) are the leading companies that have an excellent foothold in the U.S. 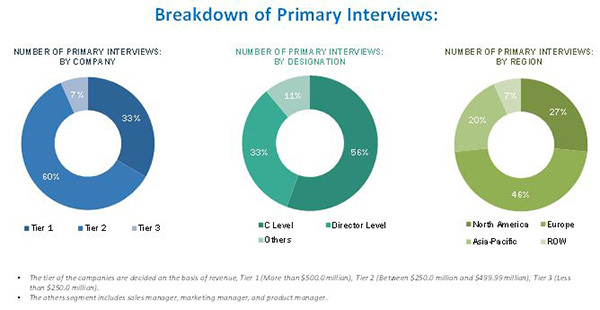 These companies are expected to account for a significant market share in the near future. Entering related industries and targeting new markets will enable the shell & tube heat exchangers manufacturers to overcome the effects of a volatile economy, leading to diversified business portfolio and increase in the revenue. Other major manufacturers of shell & tube heat exchangers are Kelvion Holdings GmbH (Germany), Alfa Laval AB (Sweden), HRS Heat Exchangers (U.K.), Brask Inc. (U.S.), Koch Heat Transfer Company (U.S.), Standard Xchange (U.S.), and Manning and Lewis (U.S.). 10.3 Hrs Heat Exchangers Ltd.
10.7 API Heat Transfer Inc.
10.9 Hughes Anderson Heat Exchangers Inc.
10.10 Koch Heat Transfer Co.